Insecurity can disrupt economic activity through a number of channels, and the effects can be large and long lasting. Fear resulting from violence and destruction can hinder economic activity directly through an increase in transport costs, capital flight, or postponing of investments. There can also be indirect effects like the breakdown of political institutions and public services such as health and education, as well as effects that spill over into other countries, such as refugee crises. Insecurity and weak law enforcement can threaten property rights and suppress economic activity. Particularly in contexts of weak institutions, countries can become trapped in repeated cycles of violence that prevent economic development. Understanding and quantifying the different ways that conflict can impact the economy is critical to informing more effective conflict prevention strategies and enabling growth. The impacts of a conflict on the economy depend on two key dimensions: its duration and intensity. Figure 1 provides a simulation of how a country’s Gross Domestic Product (GDP) per capita is affected, on average, when a civil war with a four-year duration breaks out.1 The dramatic decline in GDP per capita that countries experience during civil wars (shaded area) is clearly visible – GDP per capita is estimated to contract by about 18% over the four-year period. This is about twice as large as the collapse suffered by the Greek and Irish economies during the Great Recession of 2007–2011. Importantly, it takes a long time to recover from this economic damage. 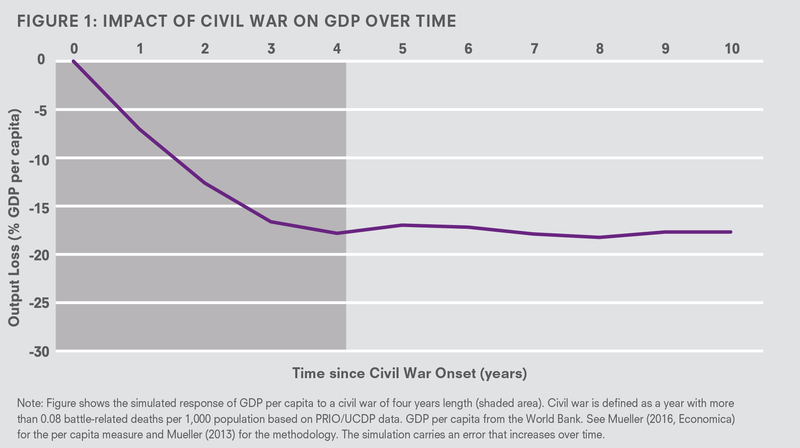 Even six years after the end of the civil war, GDP per capita is still 15 percentage points lower on average than it would be without the war. It is the severe decline combined with the duration of the economic damage that makes civil war so costly. The intensity of violence also plays an important role in influencing how much the economy is affected at the macro level. Recent evidence emphasises the usefulness of measuring violence on a per capita basis – rather than looking at total casualties at the country or state level – as the share of the population affected locally is a crucial variable for understanding how conflict affects the economy (Mueller, 2016). 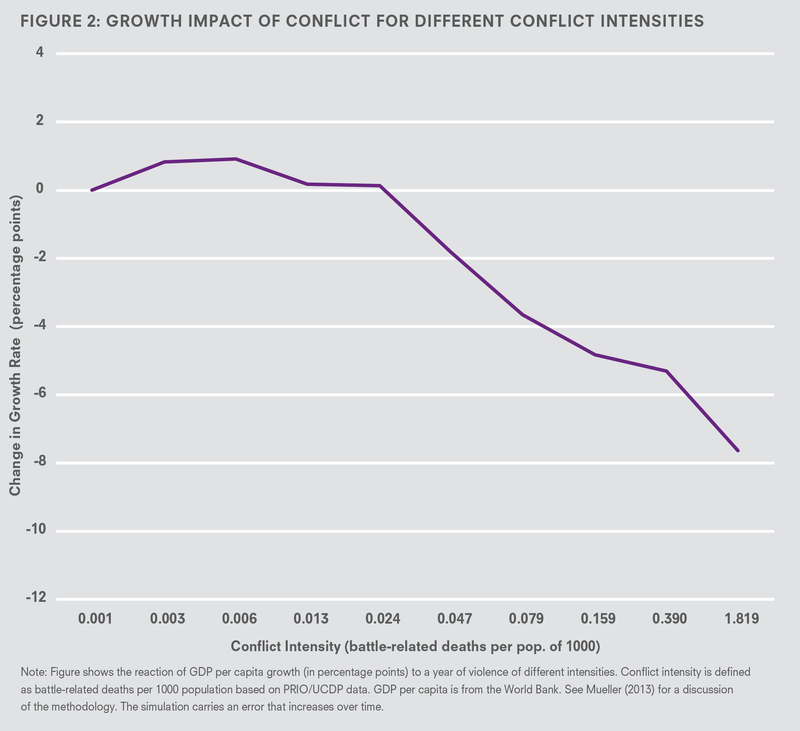 Figure 2 illustrates with the latest data available that, at the aggregate level, the economic damage done by conflict has a visible effect on GDP only at high conflict intensities (See Mueller, 2013 for a discussion of the underlying statistical analysis). It shows the effect of one year of armed conflict on economic growth at different violence intensities, measured by battle-related deaths per capita. For example, a year of armed conflict with an intensity of around 0.079 battle-deaths per a population of 1000, leads to a decrease in the economic growth rate by about 3.5 percentage points. Violence below an intensity of 0.047 has no discernible effect on the macro-economy. However, for more intense conflicts the effect is quite dramatic. The highest intensity civil wars lead to a drop in the yearly growth rate by between 5 and 10 percentage points. What does this imply for a country like Syria that has already suffered four years of high intensity violence? According to our estimates, Syria’s economy had lost 19–36% of its productive capacity by 2016 due to conflict. In absolute terms, this means that the Syrian economy produces 20–38 billion USD less in value added each year. Violent conflict is a major cause of the reversals in economic growth that many developing countries have experienced in recent decades. Indeed, recessions experienced during periods of violent conflict are a key reason for much lower average growth rates over time in fragile countries. That said, conflict does not always cause inevitable longer-term or permanent economic damage – an analysis of civil wars between 1960– 2003 showed that when the end of conflict marks the beginning of a lasting peace, recovery and improvement can be achieved (Chen et al., 2008). It is renewed outbreaks of conflict that prevent economic recovery, which is why it is so important to prevent conflict from re-occurring. In summary, it is clear that preventing conflict, or at least containing its economic damage, is critical for long-term development, and thus understanding when and how recovery works is a priority. 1 Based on a simulation using the UPCD/PRIO Armed Conflict database. Results using the correlates of war (COW) database are similar (See Mueller, 2013).